Fortify the marketing to revitalize sales. Boost sales during the busiest time of the year to maintain a foothold as the Northwest’s premier and trusted resource for supplements and other health-related products. 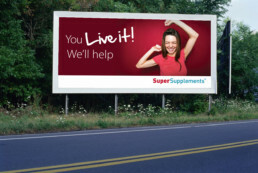 Worked with Super Supplement’s staff to conceive and deliver a uniquely Northwest campaign that felt authentic, connecting with very specific target audience segments. Developed a brand-positioning line and creative that threaded through all marketing channels, including radio, outdoor, and print. Deployed a highly effective interactive digital marketing campaign to generate consumer buzz at a critical time of year, greatly bolstering its online presence within the social sphere. Enhanced the overall brand by combining timely messaging with consumer-facing branded elements, including in-store posters, truck signage, and custom tee shirts for the sales staff. In a very short time frame, delivered a robust marketing campaign that increased sales year-over-year by 10%.